After exploring indian cooking, I have started adventuring in the Thai Cuisine. 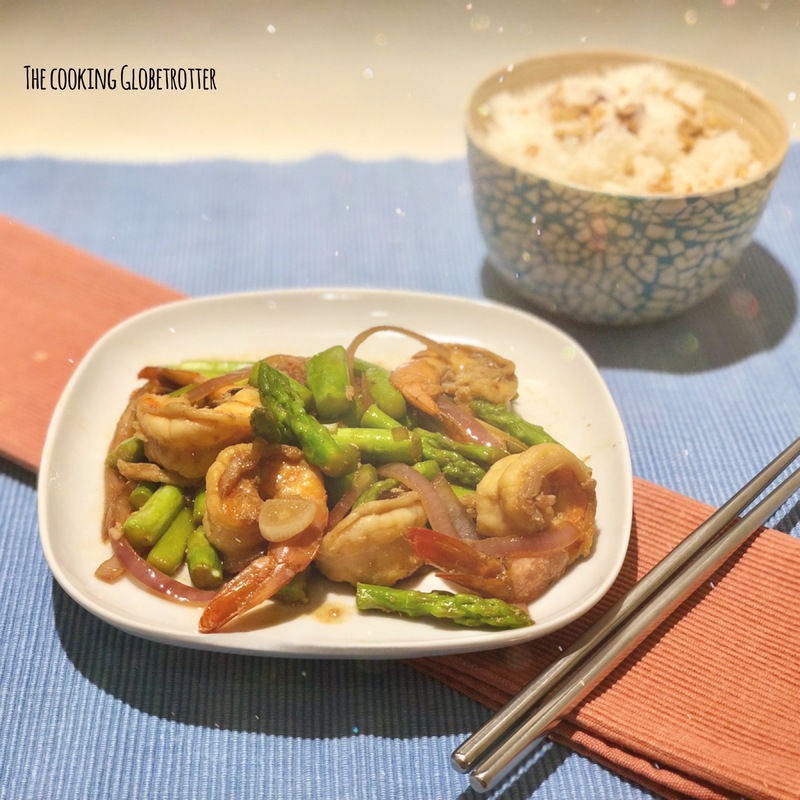 I find some dishes to be quite complex, but why don’t we start with a quick stir fry using in season asparagus? This dish, served with plain steamed basmati rice, has a wonderful thai flavor. 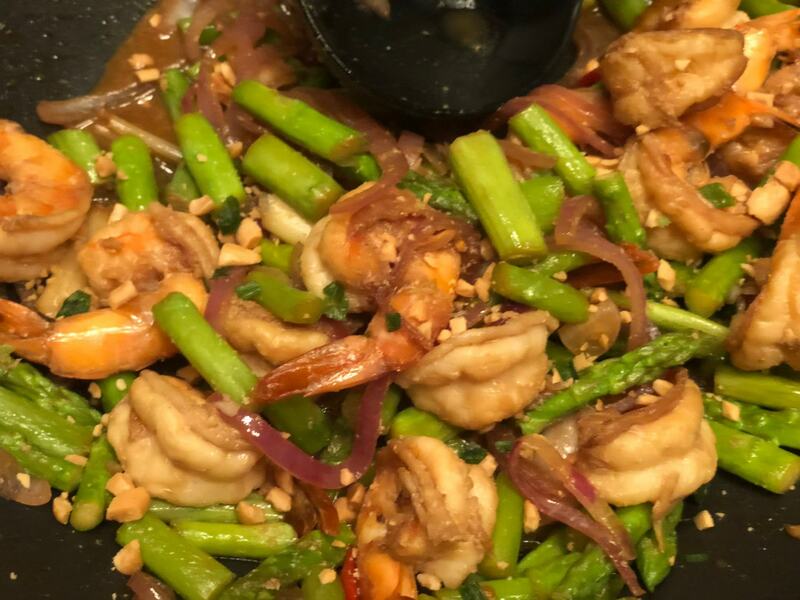 I mean, did you know, that there are Thai Asparagus? Well they are thinner then the known green asparagus but not as thin as the wild ones. They have a more delicate flavor that goes so well with the prawns! And as in every Thai dish, a good balance of sweet, spicy, salty, crunchy and chewy. If you are aiming for the original Thai experience, do invest in Thai products as they have a different flavor then the Chinese ones. 1. 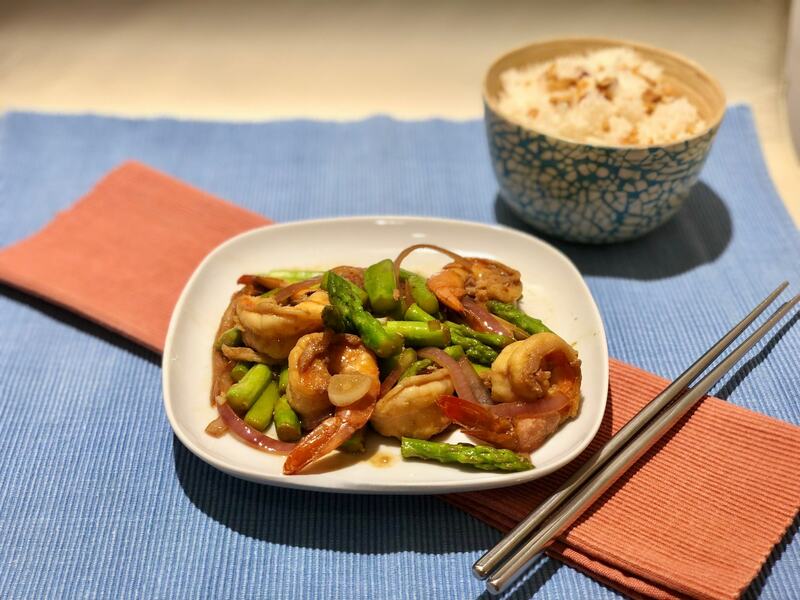 Marinate the cleaned prawns in 1 tablespoon of thai soy sauce for 10 minutes. 2. Heat 2 tbs of coconut oil in a wok, add the 2 chopped garlic cloves and fry for 1-2 minutes. 3. Add the 3 lemongrass stalks (only the white part, smashed as to release the flavors), the 20 marinated prawns and the chopped fresh chili (a whole chili for a lot of heat, only half for good heat, use a tiny piece for mild) and stir fry for 2-4 minutes until the prawns change color. 4. Add the sliced onion and cook for another 2 minutes. 5. Now add the asparagus (300g), cut in 3 cm pieces and only the soft parts. Fry for 3 minutes or until the asparagus are cooked. 6. In a small bowl mix 1 tbs of thai fish sauce with 1 ts of thai palm sugar to dissolve it. Add the juice of the lime and mix well. 7. Add the sauce into the wok and stir fry for another minute. Taste and adjust (add fish sauce if it lacks salt; palm sugar if it is too salty; lime for more tanginess or freshness). 8. Garnish with the chopped (or smashed) peanuts and chives. 9. Serve piping hot with basmati rice and a cold glass of beer.